American Chopper is ready to ride again. Discovery Channel just announced the TV show will return for a 12th season in February. The docu-series centers around a father-son duo, Paul Teutul Sr. and Paul “Paulie” Teutul Jr. who create custom motorcycles in their shop, Orange County Choppers, in Newburgh, New York. Season 12 of American Chopper premieres on Discovery Channel on February 12th at 10 p.m. ET/PT. What do you think? Are you a fan of American Chopper? Will you watch the new season? 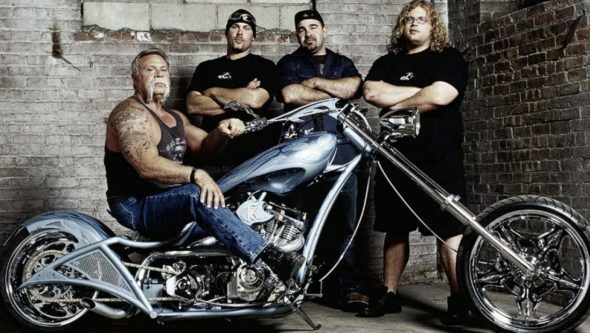 More about: American Chopper, American Chopper: canceled or renewed?, Discovery Channel TV shows: canceled or renewed? So excited about the show, really missed this family and the artwork they create!!!! Best thing for the DISCOVERY CH Thanks for RENEWING the show.. Happy trails to you…AMERICAN CHOPPER.